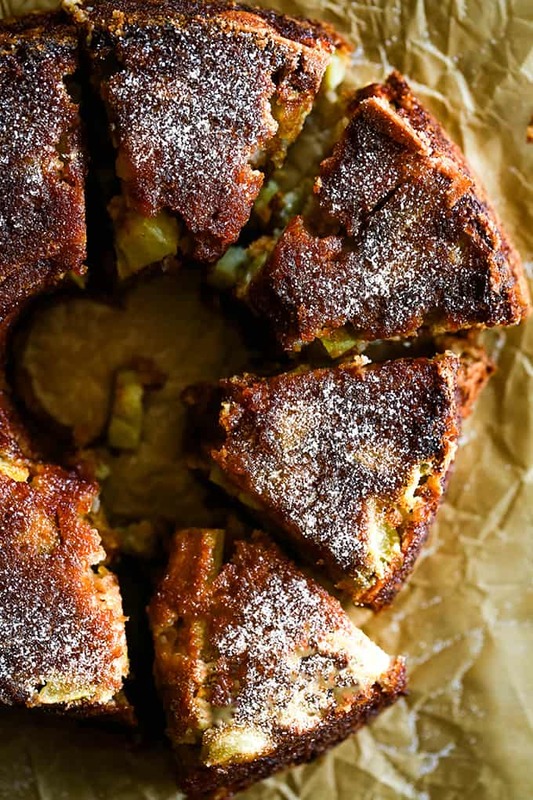 This seven ingredient Cinnamon Sugar Apple Cake is a humble little cake. It doesn’t need any sickeningly sweet glaze or gloppy frosting, no friend, this cake is just enough as is with a cinnamon sugar crust. In our 15+ years of marriage, I’ve told my husband that he was right and I was wrong exactly two times. Once, four days after we had gotten our dog, the one that I had begged for for ten years. He was right, I wasn’t ready for the task. Especially as I then found out I was pregnant with our fourth child. And the second time? This past week when I finally made this Cinnamon Sugar Apple Cake recipe that he gave me nine years ago. NINE. YEARS. For some reason I didn’t take him seriously that it really was that amazing. I stand corrected. 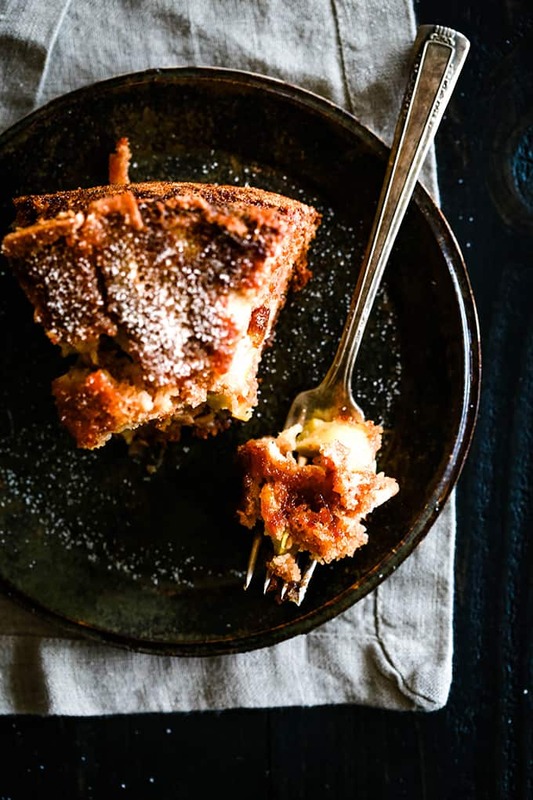 This Cinnamon Sugar Apple Cake sure is a humble little cake. It doesn’t need any sickeningly sweet glaze or gloppy frosting, no friend, this cake is just enough as is with a cinnamon sugar crust. It also requires just seven ingredients which means this is a great recipe to keep in your back pocket when you want to treat your family – or yourself! – or you have friends coming over. It takes just 10 minutes to prepare and makes your home smell absolutely divine while it’s baking. See all of that cinnamon sugar? I’m hoping it makes you want to dive through your screen to take a bite. 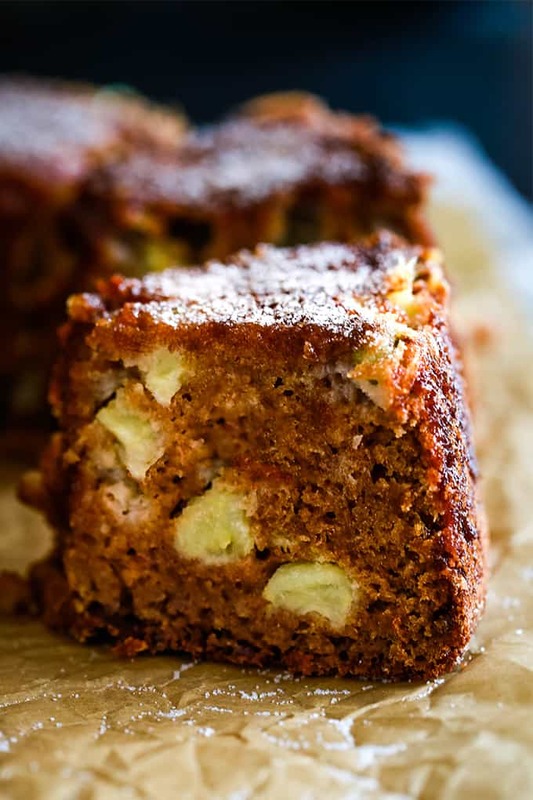 Not only is this Cinnamon Sugar Apple Cake studded with four Granny Smith apples but the apple flavor is further amped up with a cup of applesauce. 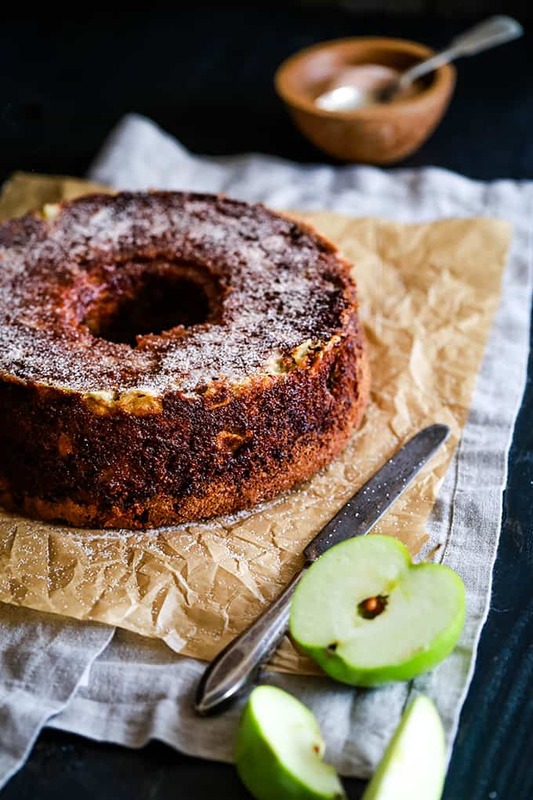 If you’ve recently made your autumnal trek to the apple orchard, this cake is begging for a chance to use a bit of your apple bounty. You know what other recipes are begging to put some of those apples to use? My super easy Snickerdoodle Apple Crisp. And my one dish Apple Skillet Cake with Maple Mascarpone Glaze. And my savory Pumpkin Pasta with Sausage and Apples. And my breakfast favorite Cinnamon Apple Oatmeal Muffins. Apple all the things, I say! 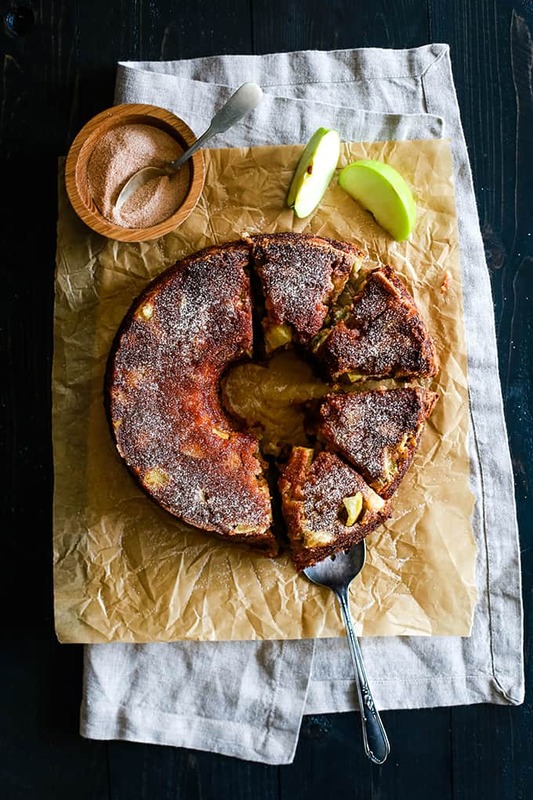 This seven ingredient Cinnamon Sugar Apple Cake is a humble little cake. It doesn’t need any sickeningly sweet glaze or gloppy frosting, no friend, this cake is just enough as is with a cinnamon sugar crust. With just 10 minutes of prep work, this is a great recipe to keep in your back pocket when you want to treat your family – or yourself! – or you have friends coming over. In a small bowl, stir together cinnamon and sugar. In the bowl of an electric mixer, add apples, eggs and applesauce. Mix on low speed until combined. Add flour, sugar, salt baking soda and cinnamon to bowl and mix until just combined. Grease tube pan and coat sides and bottom with cinnamon sugar mixture. Reserve extra cinnamon sugar mixture. Bake for 60 minutes or until toothpick inserted into center of cake removes cleanly. Allow cake to cool five minutes before removing from pan to cool completely. Garnish with reserved cinnamon sugar mixture, as desired. 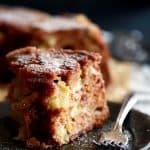 Looking for more apple recipes? Check out these decadent Caramel Apple Rolls, dinner perfect Apple Cider Chicken Skillet and this Stunning Rose Apple Tart recipe. Hi Melanie, I made the cake yesterday for my family. Everyone enjoyed it. Question for you, my apples floated to the top of the cake when cooked. Do you know why? Do think if I dust a little flour over the apples they will mix in the batter while cooking? Would I be able to freeze this cake? It looks so delicious. I would love to serve it at our brunch for the day after my daughter's wedding but I am sure I will not be up early enough to make it the morning of the brunch. Thank you!!! Hey, Cathie - I've never tried freezing this cake so I can't say for certain. You might try a test run to make sure the end result is what you'd like - definitely let me know your thoughts! 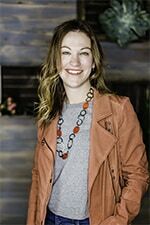 Congrats to you and your family on the upcoming wedding! I am pinning this for the fall! It looks amazing! Perfect any time of year - I have no doubt you'll love it! Can I use my canned apples? Hi, Eden - I've never tried canned apples so I can't say for sure. If you give it a try, would love to hear your results! I use unsweetened - great question, Margie! I'll update the recipe to reflect this. Can this be made with a rectangular pan? It looks good! Hi, Elizabeth - I haven't tested this recipe in a different pan, but I'm sure it could be done. You'd simply have to experiment with cooking times. This cake looks absolutely divine! Love it so much! Melanie, sweetie, you for sure, have got me on this cake and made me a true believer MUWAH XXXXXXXX thank you my friend, God bless . What a sweet compliment, Mary - thank you! This cake looks fabulous...so perfect for fall! I love apple season! This looks way beyond delicious! Think I could use gluten free flour -1:1 blend? Can't hum gum? Hi, Connie - I haven't tried using either, but I'm betting that the 1:1 blend would work. If you try it, please let me know how it works! There is something so comforting about cinnamon and sugar. This cakes looks wonderful! 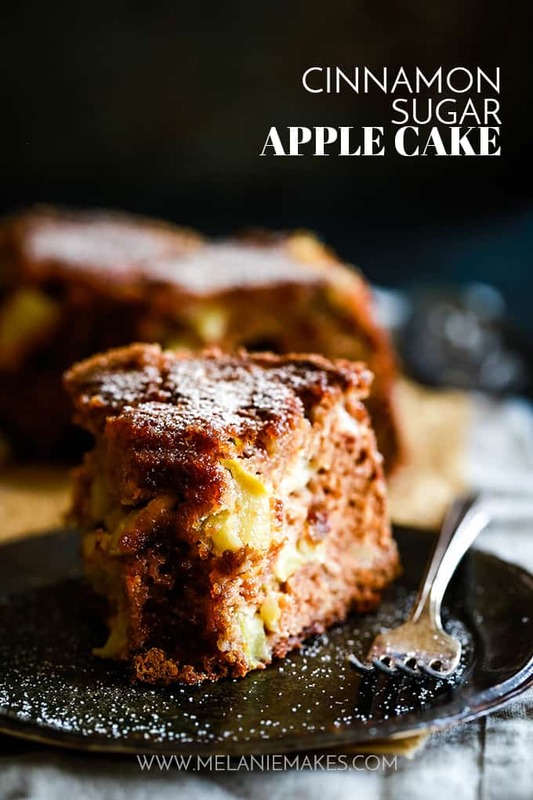 I would never pass up a slice of this amazing apple cake! So moist and scrumptious!!!! Wow, does this look amazing or what!? I've never even thought to try a fall cake- DEFINITELY putting this on my to do list! You're so kind, Karly - thank you! Such a fantastic Fall cake! This looks amazing! Something about it being so simple really does bring out the best flavor! WOW this looks delicious! Definitely saving this! I could go for a big slice of this right now! It looks amazing!